As I mentioned, the dimensions of the living quarters (RLBs – named after the company that makes them) - we are living in are approximately 9ft x 20ft x9ft; think about the size of a railroad car or a cargo shipping container. Typically there will be two soldiers per RLB unit (or cell), but right now some have three or four soldiers during the ‘out-with-the-bad-and-in-with-the-good’ (just kidding, 82nd: you did an excellent job in preparing for our success and we will do our best to pay it forward) phase of the transfer of authority (TOA) transition process. Because I am fortunate enough to have a great Platoon Sergeant, there was an empty cell ready for me, and one of my platoon members, the day we arrived. This was no mean feat as the ratio of soldiers to bunks will be a tad weighted toward the soldiers until the TOA is complete. The difference between soldiers and bunks is equal to the surface of the inside of the transitional tent where soldiers sleep on cots and live out of their respective rucks, duffels, and personal bags. It is a drag to have to spend either your first bit of time, or your last, in a tent, but it shouldn’t be too long before the ratio will swing back to the bunks and most everyone remaining here will be like my roommate and me with a twofer cell. Like convicts or people from NYC, soldiers learn from Basic Training how to establish zones of privacy when living in very close quarters. No one hungers more for privacy than a Private. Depending on things like the size of space, furniture available (or materials available to build furniture), and their respective personalities, soldiers will establish a balance of interaction and privacy. Some of the soldiers here have upper/lower stacked their beds and made the whole unit communal; others have halved or screened sections of their unit with everything from poncho liners to TK-made plywood bookcases. Other soldiers have fashioned habitrails not understandable by anyone else outside of their RLB; and still others have done nothing at all to their respective cell’s layout. My roommate and I are going the split-in-half route with some furniture walls – partially because we are working different shifts and physical barriers are very helpful with light-discipline and partially because I think we both enjoy having our private(cy). David: Thank you for the well wishes; mine go to your son as well. My advice to him, and anyone else taking a Kindle "forward", load up as much as you can before deploying as currently most theaters are outside of the Whispernet range and your ISP/IP address needs to be from a country serviced by Kindle in order to load new books. If you have ever visited Salt Lake City, Utah, you probably noticed how no matter what direction you looked, there were mountains on the horizon. It is like SLC is in the middle of a crown of mountains; some, being larger jewels than others, but all forming an encompassing ridge line. Many people, such as myself, who were born and lived there, can tell where we are in the SLC valley by which mountain we are facing. For many natives, the constant sight of the mountains in the near distance also brings a certain sense of comfort and feeling of home. I don't know about comfort, but I certainly was struck with a small sense of deja vu' when arriving in TK and found myself ringed by mountains. Although it is a bit more like being in the center of a flipped-over bottle cap versus the royalty of SLC since the heights are not so majestic as those of the Wasatch, the view is still quite impressive. If I squint some, okay, a lot, I can almost fool myself into thinking I am in Tooele or perhaps a bit further west in the Bonneville area. Although the TK mountains are definitely more craggy and weather scarred - it easy to see how the wind is actively carving and sandblasting the topography. The beast to the beauty of SLC's mountains is the frequent temperature inversions, which will cause the smog formed from automobile exhaust and other pollutants to be trapped in the valley like a bowl of carcinogenic soup. Here in TK, inversions will hopefully not be such an issue as there is comparatively little air pollution as there is zero industry and a very limited vehicular usage. So, ideally, I will get all the comforts of home without being exhausted. Len: Thank you, as always, for your kind words and support - glad to be able to keep you occupied while you were manning the bench. Steve/Mary: I am not sure why the font color changed, but I believe it is fixed on this post - thank you for reading. Mary: There are liter bottles available as well, but as you said, there is little alternative so I will need to figure out some way to recover my eco-kharma. Thank you for reading. Maggie: Nice to meet you. As you will see from this post, I am a Utah Corbin, but am sure we must have common linage. I will reach out to you via email. Meanwhile, thank you for reading. A universal theme common in the movement of armies, true even before Hannibal brought his elephants across the Alps, is ‘hurry up and wait’. This was certainly true when my flying elephant, (I’ve seen a rubber band, a shoe fly, and a moth ball, but never seen no elephant fly), actually a 767, took me and a couple hundred of my soldier comrades from Kentucky to Afghanistan. We began the movement last Sunday afternoon with gear, bags, and weapons in hand ready to move, but due to the silly rules regarding mandatory down-time for the flight crew, we ended up spending the night at the terminal with an adjusted wheels’ up time later the next morning. It was clearly not the first time such a delay had occurred as there was a ready supply of cots and blankets to be distributed. Soldiers being soldiers, with a bit of obligatory moaning and complaining, simply made themselves comfortable on cots or the floor with a rucksack as a pillow. Quite a few took the opportunity to use mobile phones to call the family and friends they had said their good-byes to several hours previously. The next morning, Monday, we eventually boarded the commercial charter and stowed our helmets, protective armor, weapons, and carry-on bags – our respective rucksacks and duffle/flight bags were in the belly of the plane. I was seated at nearly the last seat in rear and was able to see row after row of soldiers and thought to myself, this would certainly be the wrong flight for someone to try to hijack. We were in the air shortly after noon and the civilian air crew began distributing a meal that was greatly appreciated by the hungry soldiers. As soon as the chow was distributed, they handed-out free ear sets for the on-board movie(s), which began with “Get Smart” and continued throughout the entire flight with “The Blind Side”, “Taken”, and numerous others. Several hours later we made our first refueling stop in the far eastern corner of Canada. We were not allowed off the plane, but they made up for that by providing more drinks and snacks although there were quite a few grumbles from the smokers. More hours in the air and we landed in Scotland for yet another fuel stop, but no smoke breaks for the addicts. A couple of hours later we landed at a small airfield in the middle of Germany where we were allowed to deplane and were bused to a small terminal where the locals made a killing selling souvenirs, snacks, and wursts. And, the smokers were finally able to saturate their lungs for nearly two hours. At this point I was curious why a 767 had to make so many stops and was told by an experienced First Sergeant that with approximately 200 soldiers with approximately 400 pounds of gear each, the plane burned up fuel at an alarming rate. From Germany we flew to Poland, for yet more fuel, and then northeast to Turkmenistan where we said goodbye to the civilian aircraft and hello to a multinational military airbase where, after 24-hours of travel, we were finally ‘in theater’. Our stars were in alignment and a short six-hours or so later (versus the two or three days some other troops spent on site), we were on a good ol’ C17 ‘making a one-way trip’ to Kandahar, Afghanistan. Kandahar Air Field (KAF – although it seems only the people stationed/working there call it KAF and everyone else calls it Kandahar) is a large sprawling grayish-brown dust ant nest of activity - a high-transient zone where a multitude of soldiers passing through are classified as ‘pax’ (passengers) and are manifested to various fixed and rotary wing aircraft to their final areas of operation. It is difficult to convey the labyrinth of concrete barriers, ongoing and seemingly abandoned construction, tents of all sizes and function, and dry hot air. Piled at nearly every intersection of the tents utilized for sleeping quarters (it wouldn’t be accurate to call them living quarters), are stacks of bottled water; which dehydrated soldiers would grab in passing and drain in moments. The ecological green liberal part of me cringed at the thought of the thousands (millions?) of plastic bottles that would be dumped, but better the landfills than the intestinal and other woes resulting from drinking the local water. The most striking element for me was the odor – immediately noticeable and nearly overwhelming near the water/waste treatment center. For those of you who have spent time in Korea, imagine the fertilization process during the spring months at a multitude of 10. For those who have not been to Korea, imagine being locked in an over-utilized porta-potty at the State Fair in July. The dreadful mantra running through my mind the whole time I was there (and still quietly reverberating in the back of my mind): the sense of smell is particulate in nature. On the positive side, the chow was tasty, varied and in great quantity. The mess hall (pardon me, dining facility) workers were friendly and more than receptive to a request for a wee bit more - although I resisted and have been trying to eat as healthy as possible with lots of fruits, salad, and little carbs versus the plentitude of cheese burgers, corn dogs, etc. readily available. After 48-hours or so at Kandahar, I made the manifest for a Chinook helicopter to Tarin Kowt -31 soldiers on each side of the bird with all of our gear (and some ‘space available’ mail) strapped down the middle of the craft. Wearing our helmets and body armor with our carry-on bags on our laps, and rifles held between our knees (with the barrel pointed down “so you don’t shoot a hole through the roof of my bird and take out the rotors”) we lifted off the airstrip and made our way north approximately 200 kilometers to TK. We flew about 300 meters above the surface of the moon. Or at least the grayish brown, craggy and somewhat mountainous terrain made it seem that way. The flight was fairly smooth and the only discomfort was the 1,200 pounds of gear strapped in the middle of the bird directly in front of me that kept leaning over and trying to crush me. After a smooth and soft landing at the TK airstrip, we walked the 400 meters to the headquarters where we signed in, turned in our personnel folders, and were given a short briefing on the layout of the base. We then piled into buses (actually 18 person elongated vans) and were driven over to the US portion of the base where we were unceremoniously dumped along with our gear (remember 400 pounds each), which had been brought over in large trucks (LMTV’s in military parlance). I was able to track down some soldiers from my platoon who had arrived several weeks earlier and was able to reach my Platoon Sergeant who took me and two other soldiers from our platoon to the mess hall for lunch – again with pretty tasty food and generous servings – and then showed me where I would be living for the next year: a 8’x20’x8’ rectangular box that I share with another soldier. I unpacked most of my gear, made my bunk (which is constructed out of two by fours, but does have a mattress that was probably new when the war started), and did my best to keep my dazed mind and tired body awake until 2100 as I was going to have to get up at 0500 and wanted to start getting adjusted to the time zone as soon as possible. That was yesterday. After a little over five days of travel, SGT Corbin has his boots on the ground of TK and is reporting for duty. I am not the only Corbin who has written a thing or two. Alex, one of my brothers, who I outrank on the calendar being six years older, but who outranks me in the Army as he is a Major, has transmogrified his Master's thesis into a published book: "The History of Camp Tracy. 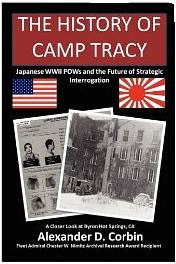 Japanese WWII POWs and the Future of Strategic Interrogation." Alex compares and contrasts how WWII Japanese prisoners of war, who were kept on American soil in Top Secret camps, were successfully interrogated utilizing respect and understanding, versus the ongoing water-boarding and other 'enhanced' techniques being utilized today on "terrorists with an Islamic fundamentalist bent." In essence, Alex answers the question how the US may obtain essential military intelligence from a hostile enemy in an honorable (not to mention legal) manner that does not compromise America's values. The book is available, in either printed or downloadable formats, from the publisher, or, in printed form from Amazon. I know one may think I could be a bit biased about Alex's book and how interesting it is, but check out the reviews posted on Amazon and judge for yourself - and then get a copy or two so Alex can afford to buy me the ice cream sundae he (and another of my brothers, Carl) owes me for winning the Corbin 2009 putt-putt golf championship this past Christmas. When soldiers deploy, they have a mandatory packing list of equipment/clothing which must be fitted into a ruck sack and a duffel bag - and it takes good packing to get everything required stowed. Any personal items must fit into a backpack, that is basically a carry-on bag - not a lot of room. When you only have about 1.5 cubit feet of space to pack personal items to last a year (or at least until care packages start arriving), you have to be very judicious in what you decide to bring. Some people cram an X-box or other gaming system and not much else. Beef jerky, twinkies, and other snackables are also common since the closest 7-11 is a couple thousand miles away. For me, a voracious reader who is addicted to the written word and regulary devours several novels/books a week, having the room for only a few books - even paperbacks tightly packed - could be a very frustrating dilemma. Thank goodness for e-readers! Particularly the Kindle by Amazon since it is very much up-front and beyond its competitors with availability of titles and ease of wireless receipt. When you can carry 1,200 books in a device weighing ounces and smaller than a magazine, you are a happy camper. Or soldier. When I started this blog, I had the option of "monetizing" by having pay-per-click ads columnized in the layout, but that was a bit distasteful to me as I wanted this to be a memorializing effort versus pecuniary. 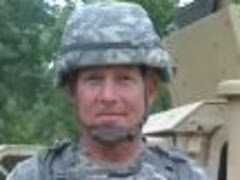 But with that said, I would like to plug M-Edge for providing me with a Kindle, a cover, and an E-luminator2 for my own benefit and to promote the awareness of e-readers to soldiers - I hope to "lead by example" how e-reading will be a way to while away the hours of down-time and, heaven's forbid, self-improve. Contrary to possible popular belief, soldiers are big readers and are very tech savvy, so an e-reader could very much be a future common item for personal packing lists. M-Edge is coming out with a military-camouflage line of covers and accessories I think could be very popular with soldiers, marines, etc. Along with my Kindle, I will be bringing a harmonica. I don't know how to play one, but I am also taking a how-to book and there are more available to download to my Kindle...my poor future roommate.